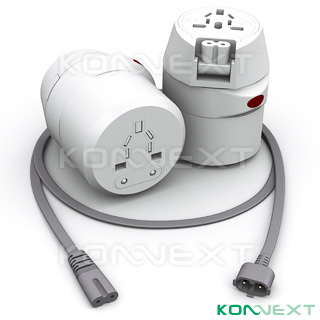 The new Konnext™ AdapterOne™ Portable Travel Power Strip keeps you connected in over 150 countries. The unique one piece design design offers extraordIHAry travel storage convenience and the patenting pending “Twist & Release” mechanism allows user to select 4 different socket styles effortlessly. Built-in 3A fuse protection circuit ensures safe power connection for your mobile devices from Australia to Zimbabwe. The AdapterOne™ Portable Travel Power Strip with USB Charger equipped with the all new Konnext™ SmartPlug™ Direct AC Slot offering direct connection to your mobile devices such as notebook computer’s power adapter, DV camcorder’s and digital camera’s charger etc… Completely replaces the AC cord that comes with the device, ensuring adaptability in over 150 countries as well as providing a spare universal AC outlet for other electronics. Power up your notebook computer thru the SmartPlug™ Direct AC Slotnd connect your additional electronic devices via the spare universal AC outlet simultaneously in over 150 countries worldwide.